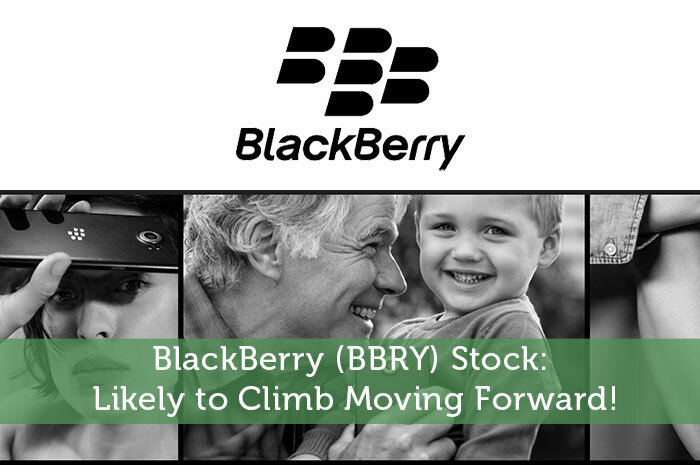 BlackBerry (BBRY) Stock: Likely To Climb Moving Forward! When you think of BlackBerry, what’s the first thing that you think of. If you’re like most people, you’re thinking about smartphones. It can be argued that the company was the leader of innovation in the industry. In fact, I remember years ago when the BlackBerry cell phones first had their big break. It seemed as though every business person had to have one of these handsets. However, as smartphones became more and more popular, more competition started to make its way into the industry. This is where problems started for BBRY. As time passed, consumers started to clearly choose their favorite operating systems, and unfortunately, BlackBerry’s OS simply wasn’t one of the favorites. Instead, most consumers prefer Apple‘s iOS and Google‘s Android. As a result, BlackBerry fell far behind, and eventually was left in the dust. As a result, the company’s share of the smartphone market fell to less than 1%! As mentioned above, BlackBerry’s biggest problem proved to be the fact that they haven’t created an operating system that can compete with the highly popular Android and iOS operating systems. The good news is that the company knows that. As a result, BBRY has made the decision to improve upon their product offering by taking advantage of the Android operating system. Recently, BlackBerry launched a smartphone that’s known as Priv. However, Priv is nothing like any other smartphone ever offered by the company. That’s because Priv is run by the Android operating system. As a result, consumers have the ability to take advantage of the incredible hardware that BBRY has been known for while having the ability to use the Android operating system that they have fallen in love with! When Priv was first announced, there were many questions with regard to how successful the offering might be. However, those questions have been answered in a big way. In fact, Priv proved to be a hit. Upon the offering of the new phone, there was such incredible demand that shipments of the smartphone were delayed! Now, BBRY is rumored to be working on another phone that blends BlackBerry’s incredible hardware with Google’s popular Android operating system. Based on what we’ve seen from Priv, it’s clear that BBRY is making the right moves to start reclaiming its share of the smartphone market. In fact, based on the success of the Priv, BlackBerry’s CEO recently commented stating that handset profits are likely to be seen in the year 2016. With that said, I’m expecting to see bullish activity out of BBRY moving forward. The bottom line is that the company’s stock has been struggling due to lackluster sales. However, with the new line of phones that are likely to sell incredibly well, profits are coming and that’s going to make investors happy. As a result, we can expect to see gains in the stock throughout 2016. Making now a great time to get in on the trends!